A partial denture is for people who still have some of their natural teeth. 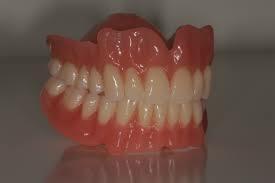 Dentures are not just for elderly patients. Patients of any age may lose some or all of their teeth and may require a denture of some sort. Because teeth are a permanent part of the body, tooth loss can have an emotional impact on some people. It is important to talk to your dentist about any fears, anxiety, or other emotions you are feeling about tooth loss. Denture adhesives may be recommended, especially for the first-time denture wearer. Adhesives may improve the retention and stability of dentures for those with minimal bone support or small ridges. Stability of the denture will help the wearer's confidence. Remove and brush the denture daily with a denture cleanser and a brush (one specifically designed for cleaning dentures or a soft toothbrush). When you're not wearing the denture, soak it in denture cleanser or water.